No Disney movie has been animated with watercolors since "Dumbo," more than 60 years ago. In "Lilo and Stitch," the medium provides brilliant backgrounds. Disney's Chris Sanders always had a clear vision of Stitch -- a scrappy alien, a fuzzy gremlin, a dervish of disaster on a scale rivaled only by Warner Brothers' Tasmanian Devil. But Sanders envisioned the alien plopped down in Kansas, living among mild-mannered forest animals, a mix of "Predator" and "Bambi." A visit to Kauai changed his mind. While touring the island, Sanders listened to a tour guide he remembers only as "Francis" expound on the notions of ohana and extended Hawaiian families. This philosophy became the backboard for Stitch to bounce off of. As Stitch's human counterpart, Sanders created Lilo, a Hawaiian girl whose longing for a secure family awakens repressed emotions in Stitch. 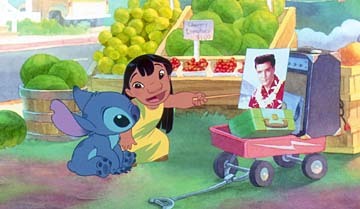 "Ohana" in the film goes beyond the simple concept of family; it encompasses an entire community. According to production notes, the concept of ohana was not a feature of the original script, but during research trips to the islands, the Disney crew heard about it so much that it was incorporated into the rewritten script -- to the point where it may become the latest Hawaiian word to achieve international usage. The Hawaii depicted in "Lilo and Stitch" is not one usually seen in films. The characters live in poverty among beautiful surroundings; they worry not only about scraping by in a depressed economy, but in satisfying rule-bound social workers; the characters speak pidgin naturally but not excessively; hula is seen as an after-school diversion rather like softball; the beach and the ocean are avenues of escape rather than a moat or boundary. In other words, this goofy, sentimental and thoroughly charming cartoon is one of the most realistic depictions yet of the islands. THE STORY MAY be up to date, but the art and animation styles are doggedly old-fashioned. To sell the concept, Sanders drew up an 18-page book of the story, with brilliantly colored watercolor sketches. Thomas Schumacher, president of Walt Disney Feature Animation, green-lighted the project right away, with the caveat that the movie's visual style be true to Sanders' concept sketches. No Disney movie had been animated with watercolors since "Dumbo," more than 60 years ago. Backgrounders preferred working with more forgiving gouache and acrylics, which have a smooth but rather gray appearance. A brilliantly colored watercolor can be ruined with a single brushstroke, which is just the sort of delay a movie production doesn't need. Watercolors can also appear rather sketchy -- the artist's hand is evident in every stroke. Sanders and crew experimented with a variety of paints and light techniques, and discovered that even after more than half a century, nothing looks like watercolor except watercolor. And so the art team in Orlando took crash courses in watercolor technique, and Sanders decorated the studio with Hawaii-style props like tiki torches and surfboards, and they made a Disney film that looks like it was made when Walt Disney was still alive. The production team also spent weeks in Hawaii, studying things like the quality of light falling from the sky and the way vegetation blooms thickly around isolated island communities. The palette positively glows, particularly in the blues and golds of the spectrum, like a Maxfield Parrish painting. The character animation is also old-fashioned, drawing on the classic big-nose, big-feet style of Freddie Moore. But the idea of a big aircraft careening among tall buildings was scrapped within a few minutes on Sept. 11, and an old-fashioned spaceship chase is inserted. The spaceships were the only parts of the film to be rendered by computer. A giant spaceship is substituted for the 747, and clouds are swapped for the buildings. Besides adding another film to the thin shelf of good Hawaiian movies, "Lilo and Stitch" stands on its own as an animated feature, thanks largely to the way it looks and thinks.